As stated,these Denby Encore dinner plates are in good used order. Price is for 1x denby reflex dinner plate. overall in good used condition. Denby Colonial Blue dinner plate 10.25 inches in good used condition, no chips or cracks with cutlery marks and with surface wear....now becoming rare. At time of listing I have 6 available and have set automated postage discounts should multiples be required. Please feel free to browse my other items as I always endeavour to combine postage. I specialise In Denby Online and if do not have a specific item you are searching for, just let me know and I will help you in sourcing it. I live close to the Denby village in Derbyshire and am in a good position to procure items in the locality. DENBY DAMASK - DINNER PLATE 10.25"
A lovely dinner plate from Denby in the Greenwich colourway. Stamped on the base with the Denby stamp. Denby Monsoon Cosmic Dinner Plates X 2. Approx 28.5 Cm. Condition is Good used. Dispatched with Royal Mail 2nd Class. Denby ODE 10in Dinner Plate X3 Available. Vintage condition some utensil marks and wear Thank lease ask for postage fee if more than 1 plate purchased. Denby Savoy - 2 Dinner Plates 10.5"
New listingDenby White Squares Dinner Plate 11.25"
Approx 11.25"/29cm between straight edges. Thanks for looking at these 6 nice Denby Camelot plates that measure around 22 cm diameter and in fine undamaged condition. As stated,these Denby Russet dinner plates are in very good used order. Denby Imperial Blue Dinner Plates x 2 (more available). Dispatched with Royal Mail 2nd Class. Good used condition. Denby Seville. 1 Denby Dinner Plate. Consisting Cup,Saucer and Plate. 2 Trio sets. 1 Sugar Bowl. 1 has small chip to underside of rim as can be seen photo No.5. No cracks or crazing. Photo No.3 is a plate. Denby Savoy - 4xDinner Plates 10.5" Great Condition. DENBY TROUBADOUR. ROUND 10" DINNER PLATE. 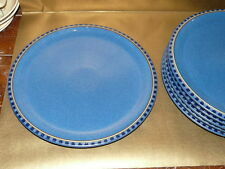 Denby Everyday Cool Blue - 2 Salad, Starter or Dessert Plates 7.25"
Set 4 dinner plates and 4 bowls. Turquoise and brown colour. They are in excellent condition, very small amount of wear. One of the plates has a very small chip on the bottom. Approximately measurements Dinner plates: 26 cm diameter Bowls:17 cm diameter.8 cm high If you have any questions, please ask Thanks for looking! 10 pieces of Denby pottery. 4 x Dinner Plates, 3 x Side Plates and 3 x Bowls. Cream coloured on the outside and Plum on the inside. The dinner plates measure approximately 28cm in diameter , the side plates 21cm in diameter and the bowls 16cm in diameter and 7.5cm high. These are in a used condition with some use related scratches, cut marks and blemishes, mainly to the cream coloured parts as can be seen in the photos. There are no chips or cracks. Please look at the photos carefully as they help to form the condition description. It is in good condition with little wear. 2 Denby Jet Stripes Dinner Plates RRP £18 Each. Condition is Used. Dispatched with Royal Mail 2nd Class. Denby Green Wheat Dinner Plates x5 . Condition is Used. Dispatched with Royal Mail 2nd Class. Denby England ROMANY 2 Dinner Plates 10.25"
Romany Denby 2 x dinner Plates. Denby colonial blue dinner plate, 26cm diameter. Condition is Used. Dispatched with Royal Mail 2nd Class. These plates are blemish free,with no cutlery marks at all. As stated,these Denby Greenwich dinner plates are in good used order. Denby Greenwich Dinner Plates X 3. These have been used but in great condition with no chips or cracks. Dispatched with Royal Mail 2nd Class. Denby Stoneware Glyn Ware Vintage Pottery Dinner Plate 10" dia.